This entry was posted on September 8, 2010 by iheartfilm. 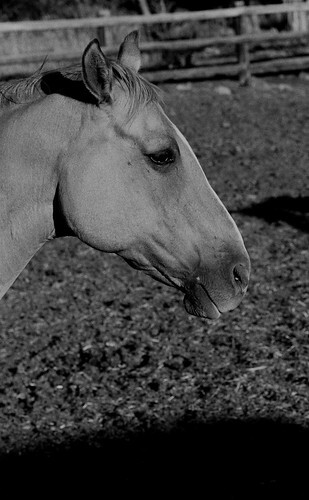 It was filed under Black and White, Ilford Delta 400, Portrait, Summer and was tagged with Black and White, film, horse, Ilford Delta 400, montana, nikon f100, noritsu koki, paradise valley, photography, potrait. what an awesome portrait. i love horses. there’s a ranch near us, and i go by there often to see the horses after work. i’ve taken a few pictures – some on film. i’ll e-mail them to you: see what you think. did you shoot much in montana? I only shot four rolls out there, but I did shoot a lot of horses. Wait, that came out wrong. Well, you know what I mean . . . I love all kinds of animals…love this photo! Great image. Love the subtle tones on his/her head.